This paper uses data gathered from an ESRC funded research project on social networks, social capital and lifestyle to provide an account of narratives of belonging and social involvement. Drawing on data from 88 in-depth interviews carried out in the North-West of England between 1997 and 1999, we identify how parental involvement in voluntary organizations connected to their children, such as Parent Teachers Associations (PTA), figures in middle class narratives as a vehicle through which to perform belonging and social involvement. We argue that social involvement through children is presented as a dimension of feeling located in place socially. By using data from two contrasting areas, Wilmslow and Cheadle, we show how this concern to perform locally based parenthood nonetheless leads to very different patterns of engagement. The mobile, middle class in Wilmslow seek to build social capital through the generation of loose social networks based around children and children's education. We suggest that this serves the dual purpose of connecting them to 'like-minded' people and to the educational establishments they value as a means of getting ahead. In Cheadle, the generally less mobile respondents use their more local habitus to generate bonding forms of social capital with tighter social networks based around, kin, residence and leisure that enable them to 'get by'. We argue that the narratives of participation articulated relate to the respondents' degree of embeddedness in the locale, the different place-based habitus of each area and the gendering of family practices. At the heart of many of these narratives, particularly but not exclusively in Wilmslow, are tales about being a 'good' parent and more particularly of being a 'good' mother. This paper explores how parental involvement in voluntary organizations connected to their children, such as Parent Teachers Associations (PTA), figures in narratives of personal identity, as a vehicle through which to perform belonging and social involvement. In contrast to sociologists who focus on how people seek to perform modes of 'distinction' in their social practices, we show that social involvement through children is presented as a dimension of feeling located in place socially. Using data from two contrasting areas in the North-West of England, Wilmslow and Cheadle, we show how this concern to perform locally based parenthood nonetheless leads to very different patterns of engagement. We show how narratives of participation relate to the respondents' degree of embeddedness in the locale and the habitus of each area, and we show how this relates to the gendering of family practices. We firstly examine theoretical issues regarding social capital before turning in the second section to explain our research methodology. Drawing on other papers from our research project, we show how Wilmslow and Cheadle exemplify different kinds of place-based habitus. In the third section we examine how people talked about their involvement in the PTA, before going on, in the fourth section, to discuss how Wilmslow parents used PTA involvement to invoke certain forms of social capital. Our final section explores how PTA involvement mobilises themes of involvement and belonging. Over the past decade the work of Putnam (e.g. 2000) and Etzioni (1996) has generated a good deal of interest in community, communitarianism and social capital from politicians and social scientists alike. Giddens (1998) argues that the 'theme of community is fundamental to new politics ....not just as an abstract slogan' (78-79), because civic decline is seen to be a key cause of many political and social ills. The key role of children within this communitarian project is identified by James & James (2001), who note that the White Paper, 'Excellence in Schools' (1997) encourages 'parents and local communities (to be more) effective in the education of children' (cited in Wyness, 2000:44). Social involvement is presented as being of key importance to the well being of communities and the people within them. It is argued that this serves to emphasize and reassert 'that parents and communities are responsible for children' (James & James, 2001:217). James & James (2001) argue that there is a tendency to focus on communities as undifferentiated social entities, with shared normative understandings, while little attention is paid to the ways in which social diversities, such as class, gender, or ethnicity, can exclude people from belonging to the community. Frazer (1999:160) claims that discourses of community can conceal tensions, conflicts and fractures. Importantly, children themselves are rarely given an active voice within such concerns. The work of Robert Putnam is significant in identifying the social and political consequences of declining involvement in the USA. Putnam argues that there has been a decline in social capital: that is 'connections among individuals' - social networks and the norms of reciprocity and trustworthiness that arise from them' (Putnam, 2000:19). Importantly, Putnam draws attention to the different dimensions of forms of social capital: 'bridging', the 'sociological WD40' and 'bonding' the 'sociological superglue' (2000:22-23). A key means of acquiring this social capital is through participation in voluntary associations. Putnam shows how membership of voluntary associations has declined significantly in the USA since the 1950s, and he identifies two key, main contributory factors. Firstly, he suggests that there is a generational dimension: what he terms the baby-boomer generation is less civic minded than the long 'civic generation', which preceded them. Secondly, and to explain this generational effect, Putnam looks to the increasingly prominent role that television has played in lifestyles since the 1950s. Hall (1999) draws attention to the distributive dimension of social capital. He argues that there have been 'discrepancies between the levels of social capital found among the working class and the levels found among the middle class, in particular; and those discrepancies appear to have widened' (1999:34). This claim is confirmed by Li et al. (2002) and Warde et al. (2003), and recent evidence from the British Social Attitudes Survey argues that people who are socially well connected and trusting tend to lead more secure lives than those who are not (Johnston & Jowell, 2001). All this body of work relies heavily on quantitative evidence. While these authors have made a crucial contribution to the work on social capital, there is a need to enhance and develop this body of work. Undertaking a more qualitative approach will enable us to complement these data and help investigate how certain ways of talking illuminate the meanings of cultural practices in everyday life. We argue that paying attention to individuals' narratives of social involvement allows for a fuller explanation of the barriers that exist to participation. Importantly, it can also provide insight into the narratives of legitimation that social actors utilise to explain involvement or non-involvement in particular types of activity. We shall seek to address this deficiency through an analysis of discourses of social involvement around children elicited during semi-structured interviews carried out with middle class people in the north west of England. How individuals present themselves in everyday life (Goffman, 1969) and how as social actors they narratively perform their social involvement can provide telling insights into issues of identity and belonging. It can enable a fuller understanding of the extent of the involvement, its role in generating social capital and its relation to other cultural practices. In particular, it can direct attention to the gendered character of narratives of social involvement. Putnam does address the issue of gender and acknowledges that social involvement is differentiated by gender because, 'women are more avid social capitalists than men' (Putnam, 2000:95). However, he is unable to uncover the ways in which narratives of social involvement can be framed by normative understandings of parenthood, and motherhood and the ways in which social involvement or the lack of it can be performed as everyday behaviour. Moreover, engaging with peoples' talk around social involvement allows us to identify how such practices can change over time, in type and depth. Our research, funded by the ESRC, examines the lifestyles and social integration of residents in four contrasting areas of the North West of England. Each of the four areas was chosen to exemplify a distinct type of residential location. Wilmslow is one of the most affluent areas of North Cheshire and here we interviewed in areas of detached housing, where properties were valued between �250,000 and �750,000. Cheadle was selected because it seemed to conform to the stereotypical inter-war estate of semi-detached housing. Houses here were valued at between �50,000 and �65,000. We aimed to obtain 50 in-depth interviews in each area, and these were tape-recorded and transcribed. We interviewed a member of one household in three in selected streets, using a semi-structured interview schedule. Interviews covered the following topics: neighbourhood; leisure interests; household relationships; activity in voluntary associations; work and employment; with some final questions on social and political attitudes. We concentrate on Wilmslow and Cheadle because the distinctive class habitus of the respondents in each area, and their differing degrees of embeddedness in the localities, enable us to identify important similarities and differences around issues of social involvement and belonging. The narratives that we consider come, in the main, from responses to a question that directly probed for voluntary association involvement and PTA membership, although in some cases they come from other points in the interview where this topic arose in response to other questions. Figures 1 and 2 above indicate the different profiles of the two areas. In Cheadle, most respondents were grouped in ACORN codes indicating they were established, relatively immobile, but not especially affluent households. In Wilmslow, by contrast most households were classified as being in wealthy suburbs. 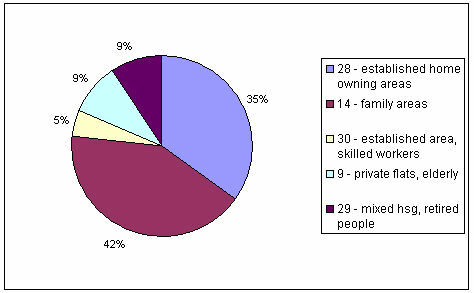 The demographic characteristics of the Wilmslow respondents are set out more precisely in Table 1 indicating the affluent middle class nature of the sample. Over half the sample had household incomes of over �60,000, and not a single manual worker appears in this sample. Nearly two thirds of respondents had service class occupations , and of those who did not, nearly all were women living with men in service class jobs. The sample tended to be middle aged or elderly (70% being over 45), which is not surprising given the cost of houses in this area. We have argued elsewhere that Wilmslow is home to affluent corporate employees who can be seen as a regionally based distinctive northern middle class, exhibiting characteristics of the local and the cosmopolitan (Savage et al., 2003a). We indicated that globalising processes do not eclipse the salience of localised identities, but re-work them through the consolidation of new forms of territorial belonging, generating new kinds of regionalised class identities (see further Bagnall et al. 2004). Moreover, drawing on Bourdieu's (1985) arguments concerning habitus and field we highlighted the social significance of physical space and employed his appreciation of the differential spatial embeddeness of various 'fields' to provide a way of comprehending the complexities of contemporary spatial identities. People narrate differential feelings of 'belonging', which are crucial for the articulation of class and lifestyle (Savage et al., 2004). In Wilmslow, people's attachment to place came from their sense of it as a convenient node for those with ties and loyalties to the North of England. The group most at ease with living in the area were cosmopolitans, to the extent that they tended to be mobile in the course of their careers and work. However, their attachment to Wilmslow was located in the sense that the area was an 'appropriate' place for someone like them to be living. It connected them to their own biography whilst also permitting convenient access to and from a variety of sites that were significant for work, leisure, schooling, children, family contact and consumption. We have also drawn attention to the refrain of ordinariness that is particularly resonant in respondents' narratives around issues of social class identity (Savage et al., 2001). Here, we will argue that the Wilmslow respondents' talk of participation in voluntary associations relating to children was articulated as reflecting and reinforcing their class identity and a habitus based around diffuse networks and weak ties (Granovetter, 1973). Moreover, while respondents used narratives of social involvement around children to perform belonging and attachment to a particular place, close examination of these narratives allows us to identify the instrumental dimensions of this social involvement, and how gender identities are articulated through them. In contrast to Wilmslow, Cheadle was the least affluent of our four areas. As our research unfolded (Savage et al., 2003b) it became clear that many respondents identified as working class and the lifestyles of estate residents seemed more typical of what have been identified elsewhere as working class neighbourhoods. The demographic characteristics of the Cheadle respondents identified in Table 2 highlight the differences between the two chosen areas. As the data indicate, a lower proportion of our respondents here were in the professional and managerial service class, and these were mainly younger professionals working in the public sector. A sizeable minority (35%) were in manual, working class occupations, again a notable contrast with Wilmslow. At least 12% of households had incomes of under �10,000 and, somewhat differently to Wilmslow, only two households reported incomes above �40,000. In Cheadle the sample also generally tended to be more male-based (65%) and younger (53% under 45). In a number of households complicated shift arrangements operated to allow both partners to work whilst covering childcare, which is perhaps a contributory factor to the over-representation of men in the Cheadle sample. Here, women were often managing complex time schedules of paid employment and child-care. In contrast to Wilmslow, the majority of Cheadle respondents were much less mobile, either socially or geographically. Cheadle people were more embedded in the locality, with stronger links to the area through ties of residence and family. 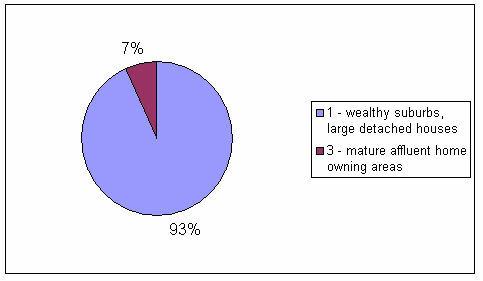 Respondents articulated their identity through the interconnection of place, family, work, and leisure (Savage et al., 2003b). We identified a habitus based on the power of 'strong ties' (Granovetter, 1973), rather than the diffuse networks, which were more characteristic of Wilmslow. The local habitus was dominated by the travails of everyday life, and the coping networks and survival strategies that people enlist to get by (Savage et al., 2003b). Putnam (2000:23) draws comparisons between 'weak ties' and 'bridging social capital' and 'bonding social capital' and 'strong ties'. Citing the work of Souza Briggs (1998) he suggests that bonding social capital is good for 'getting by', while bridging social capital is vital for 'getting ahead' (Putnam, 2000:24). We will argue that the Cheadle respondents used children to perform belonging to a much lesser degree than our Wilmslow respondents, particularly with regard to school-based voluntary organizations. Indeed they often vehemently rejected this form of social involvement, with non-participation in such groups being articulated as normal. This is not so say, of course, that our Cheadle respondents were not engaged in social participation. Rather, such participation was framed by existing strong ties of residence and family. However, as we will show, these were also gendered tales. It is important to note how the male respondents in Cheadle described involvement with children's voluntary organisations based around sport (particularly football) while rebuffing involvement in school-based organizations. Significantly, too, we will show how a mapping of the narratives of the more mobile younger middle class professionals displays similarities to the patterns identified in Wilmslow. We will now examine the ways in which our respondents with children of school age talked about their involvement or non-involvement in school-based voluntary associations, such as Parent Teacher Associations, or Parents Associations. This will enable us to identify the extent and depth of this involvement and the narratives that are used to legitimate social action or inaction. These narratives are consistent with a pattern of discourses found in talk about other key dimensions of middle class culture (see Longhurst et al., 2001a; Longhurst et al., 2001b; Savage et al., 2002a; Savage et al., 2001). Importantly, by drawing on the similarities and differences between Wilmslow and Cheadle, we would argue that this is consistent with our findings that claims to 'ordinariness' are a common refrain among different middle class groups. Social involvement through children could be seen as 'ordinary', but significantly gendered, behaviour. It has been argued that families are about a 'sense of identity, togetherness and belonging to a unit' (Ribbens McCarthy et al., 2001:768). However, Brannen et al. (1996) have highlighted the importance of paying attention to the permeability of the boundaries between families and the outside world and the role that children play in their negotiation. The Parent-Teacher Association (PTA) thus provides us with a useful vehicle through which to map social involvement. Putnam uses the PTA to illustrate his thesis about the decline of civic participation, stating that in the USA in the mid-twentieth century the PTA was 'among the most common of community organizations' (2000:55). By the early 1960s it had more members than any other secular organization and it encompassed nearly half the families in America (Putnam, 2000). Importantly, Putnam suggests that this sort of connectedness appealed to parents who wanted to be engaged in their children's education, and that 'membership in the PTA betokened a commitment to participate in a practical, child-focused form of community life' (2000: 56). However, Putnam argues that parental participation in an array of parent-teacher groups suffered a substantial decline after the 1960s, leaving him to claim that 'one need not romanticise PTA meetings of the 1950s to recognize that many Americans nowadays are less involved with their kids' education' (Putnam, 2000: 57). Table 3 shows that 80% of our Wilmslow respondents with school age children are, or have been, involved to some degree with the local PTA. Moreover, 63% of them claim to have a depth of involvement, such as being on the PTA committee, or regularly attending meetings. This is quite different to the picture that emerges in Cheadle. Table 4 indicates that only 35% of our Cheadle respondents or their partners are involved with their own PTA, and only one respondent claimed to have a deep involvement. It is also significant to note the picture that emerges with regard to the mode of education used in the two areas. The prominence of independent education for the Wilmslow sample is particularly striking, with 55% of the sample sending their children to independent schools, or a mixture of independent and state schooling. This is considerably higher than the national figure of 7% (Social Trends, 2001) or the regional figure for the north west of 5% (Regional Trends, 2001). Our interview data from Wilmslow suggest that the choice of mode of education, (either state or independent) frequently gave rise to complex moral tales of legitimation, often drawing on respondents' life histories. For example the Director of Human Resources for a multi-national company was keen to stress his commitment to the state sector. Interviewer: 'What school did your children go to, did they go to the local schools? W51: They all went to a local comprehensive. Interviewer: So you used the state system then? W51: Yes, we're very committed to the state system and in fact so committed that when I came here and found that the local school needed equipment I became a governor, or was invited to become a governor, and I'm now chair of governors. Interviewer: So you're quite committed to that side of it? W51: Yeah, we were both brought up in state schools and went on to university and have a very strong commitment to state education, and wanted the children to actually experience the same, albeit in somewhat different and difficult circumstances. Interviewer: You mentioned you were governor of the school. That's not a club as such, obviously, but it's a committee that you're involved in. What made you join that? W51: Well, I was driven, primarily, by the need for improvement in the school at that time and the fact that if we did and were going to send our children there, then some active involvement in it was going to be necessary. But also I was driven by the fact that I've always tended to commit some time, particularly to education, for a long time having been chairman of governors of the primary school that my children attended. This narrative of involvement was typical of Wilmslow, in particular the edge of instrumentalism that pervaded this talk of social involvement. It is similar to that identified by Ball (2002) in his studies of middle class parenting in London. We can now explore this issue a little further, by considering how people narrated their involvement, or lack of involvement, in the PTA. In Wilmslow, in particular, one of the issues that emerges when narratives around children and membership of voluntary associations are analysed is the degree of instrumentalism that frames the talk. This instrumentalism has different dimensions, for example it can be identified in the ways in which social involvement around children is narrated as a mechanism through which to access and build social networks. We argue that this can be connected to the degree of embeddedness that respondents have in the locale. This way of talking was particularly prominent amongst our more mobile and cosmopolitan Wilmslow residents, for example from this woman, who had moved to Wilmslow from Cambridgeshire five years ago as a consequence of her partner's work. Interviewer: Why did you join the parents' association then? Interviewer: And how active are you? Interviewer: And has your attachment changed, has that changed over time? W.5: Yes, I have always been involved...it is a mechanism of meeting people and becoming part of something, because you don't have that feeling of belonging in the area when you come into it and it's much quicker to become part of something, and also it gives you a closeness to your children. Considering that school takes up a lot of their time in life, so you're actually sharing that. Interviewer: O.K. Do you feel attached to other mothers in the Parents Association? W.5: Hmm. I've got a lot of friends from it. Well, friends and acquaintances, more acquaintances probably than close friends. The importance of children in helping build social networks is also prominent in the case of W13 (Female, 40), who moved to Wilmslow with her partner from Tunbridge Wells, and is, and has been active in a range of formal and informal voluntary organizations such as the NCT, Church, Babysitting Circle, Swimming Club, a Support Group for Disabled Children and the PTA. Interviewer: What's your involvement with that? Interviewer: Why did you join the PTA? W.13: Well, partly to meet people, partly to help fundraising for the school, and it's quite a good way of finding out what's going on as well. Interviewer: Do you feel attached to other people there? Interviewer: Have you made friends there? Interviewer: Is that with people who actually go to the PTA meetings? Interviewer: And would you see those friends away from the PTA or would it be mainly school events? Interviewer: Is it mainly to do with the children? W.13: Yes, and we have other social things at night, the so-called Friends Club, so there was a lot of other activities. These extracts indicate the way in which the connections to other parents are seen as 'weak ties' (Granovetter, 1973), but are vital in providing access to social networks in the area, where a mobile middle class exhibit characteristics of the local and the cosmopolitan. Frazer (1999), too, has drawn attention to the idea that loose ties of acquaintanceship and friendship can be important both for individuals and their social outcomes. There is also evidence here of the gathering and deployment of bridging social capital, enabling respondents to widen their range of contacts and integrate into appropriate networks (see, also, Ball, 2002). However, it is important to note that there is also a degree of insularity here, more consistent with a bonding form of social capital, and supporting Putnam's argument that these two forms of social capital can co-exist within social networks. In the following extract we can also begin to identify the instrumentalism involved in membership of the PTA. Such involvement can play an important role in securing extra knowledge or, 'cultural capital' about the education of children. Bourdieu has written extensively about the relationship between home background, family, education and the building and transmitting of cultural capital from parents to children ( Reay, 2000; Bourdieu, 1977; 1998; 1999). As Sullivan (2001:910) demonstrates in her recent operationalisation of the concept, 'cultural capital is one mechanism through which higher class families ensure educational advantage for their children'. The narrative below illustrates the complex inter-relationship between the building of social and cultural capital. W.12: Because I have got so many groups it is quite regular - almost once a month with a group - yes - a group of friends, not just me and we tend to go to things at schools as well, which we both try and go to, meetings and that, if we can. If it's PTA, I tend to go to those. Interviewer: I'd like to ask some questions about whether there are any clubs or associations you might be in? Interviewer: Why did you join that? W.12: I went because I know that you find out a lot about the school and how things work and to meet other mums that I perhaps don't meet at the school gates, and things like that. Just the interaction and to be part of it really, and I like to know what's going on.... I'm intending to go to all the meetings if I can, as many as I can, and sort of take it from there. Interviewer: Do you feel attached to other people who go there? W.12: Yes, the headmistress chats to you as if she knows you.... they make you very welcome ... playschool as well.... I didn't feel as though I was completely new to it at all really... familiar faces dotted around the circle so I didn't feel as though I was completely new to it at all really. Interviewer: What sort of people do you think join the PTA? W.12: Well, a mixture, I think, some maybe like I do, to get something from it, outgoing.... perhaps don't work and don't do anything else and really throw themselves into school activities and perhaps have things to offer, you know, through their husbands or something....... a mixture of people. Ball (2002) sees this kind of social capital as allowing access to the kind of 'hot' (rather than cold, i.e. documentary) information which enables children to succeed within the education system. This way of talking about involvement with the PTA, and networks around children was less prevalent in the Cheadle sample, although echoes of it could be heard from some of the younger professionals with young children at nursery or school, who were newer to the area and less embedded than most in terms of family and residential networks. For example, did C114, (Female, 32, Staff Nurse), who has no immediate family in the area, or any long-standing connection to the area, like living in Cheadle? C.114: Yes, very much, actually. The schools are good, which was something we didn't consider at the time because we weren't really expecting to have two children by this stage, but we've just been very lucky really. The facilities are quite good and it's quite easy to get to places and there's a lot for the children to do. Five years now we've lived here. Basically, we moved here because my husband was working here and I got a job, I was originally living on the Wirral and my husband was here working for British Aerospace, we just met and settled here. Interviewer: And your eldest, is he at school? C.114: He's at nursery, he goes to school in September, and that's literally ten minutes walk.... [N]ow I only do night shifts, so I'm around all the time during the day and yes, more now, I feel I belong more. I think with Daniel going to nursery as well, you tend to meet more people and get involved a bit more with what's going on. Interviewer: Does that mean that you've become friendly with other women, for example? Interviewer: So do you feel part of the community here, would you say? C114:	Well, again, more so now. I think it's very easy when there's just the two of you to just get involved in doing just what the two of you want to do, but when you've got children you get involved more. So, more and more so, getting involved in things that are going on in the school. Interviewer: The PTA and those sort of things? C114: Well that's something that I think my husband would like to do.... Rather than just pottering along and going with the flow, you do want to - actually want to - get involved and change things that you're not happy with. Interviewer: Parent Teacher Associations? Things to do with school, anything like that? Interviewer: Are you friendly with any of the children's parents? W.42: That's really where my wife has made most of her contacts, apart from where she works, as well. And where we lived before that has been a great meeting place, the school gates: when you are waiting for the children, or when taking them to their events. My youngest daughter is in Rainbows and you meet a lot of parents there and quite often we will combine the travel ... and at football as well, 'cause its the same parents there. In this section we discuss the ways in which involvement in the PTA is narrated with respect to belonging and self for the majority of our respondents in Wilmslow. Bourdieu (1999: 128) argues that 'individuals who move into a new space must fulfil the conditions that that space tacitly require of its occupants.' Certain spaces require certain types of economic, cultural and social capital. We argue that 'doing' the PTA is one means for people in Wilmslow to acquire the necessary capital to 'belong' because it is seen to generate 'like-minded' (W98) networks of people. Interviewer: What sort of people get involved with the PTA? W.88: Very middle class, professionals, management that sort of thing, but with the same ideals about bringing up children; interested in their children's education and just with a similar lifestyle to what we have .... go out and have a meal with a friend. But generally, no, I go to a lot of PTA meetings and things like that and he [partner] has a lot of evening meetings, nights on call of stints working in the emergency centre, so he works quite hard. Interviewer: Have you become friendly with any of your children's friend's parent's? Interviewer: So how has that happened? W.88: You just find that you get on with them and they come round for dinner. If my husband gets on with her husband, then you would take it further forward. If they didn't, then you would tend to stick to coffee mornings with them. Interviewer: So would you say you felt part of the community here then? W.98: Yes, there are communities and the Primary School and it's PTA is one. There's lots of little overlapping communities, so you can find a support - I mean it's not lonely. I mean I was very strongly church oriented in Muswell Hill and we struck away from that, the children's sport took Sunday mornings.... Well, he's drawn into our social life here, we do share it. So, no, our contacts are through the children and he [partner] is included in that: he comes to the PTA fundraising barbecue. Last year he was barbecuing and I was serving and my other daughter was taking money. For our Wilmslow residents, social involvement around children and schooling was presented as 'normal', everyday behaviour, reflective of a habitus based around bridging social capital, weak ties, and getting ahead. However, we have to be careful here to avoid constructing middle class attitudes and practices as normative (Reay, 2000). Certainly, not all our Wilmslow residents were deeply involved, or enamoured with the PTA. Yet, as the following extract shows, this female respondent felt the need to provide a narrative of legitimation, based around 'time' to justify her own non-involvement. Interviewer: Do the schools you send your children to have the equivalent of PTAs, and do you belong to them? W.27:	No. I run a mile. I just haven't got the time in my life at the moment for it. It tends to be, basically, the mothers that have nothing better to do, I think, they don't work, or they do voluntary work or something like that.... It seems so trivial. I know it sounds awful, but to raise �50 after you've spent months planning something, organising it and having meetings about it. To me, I just don't want to do it. The above extract echoes accounts from our Cheadle respondents, where respondents were generally dismissive about involvement with the PTA. This was particularly noticeable in the talk of the male respondents. Here, involvement in the PTA was noticeably to be avoided. Interviewer: Have you ever been involved in PTAs? Interviewer: Can I just ask you, through your children at school, are you involved in any Parents Association or anything like that? C17: No, not at the moment, not involved at all. Interviewer: Is it something you might do in the future? C17: I don't think so. I think the people who are attracted to it don't attract me, basically. Although formal, school-based, organisations were to be avoided, it is important to note, as Table 4 indicates, that a number of the male Cheadle respondents were involved in voluntary organisations centred on their children, but this was generally connected to sporting or leisure activities. However, the female Cheadle respondents presented non-participation in the PTA somewhat differently. Here, as in the Wilmslow extract (W27), 'lack of time' is used to legitimate the lack of PTA involvement, but the respondent is also keen to highlight her 'good' mothering practices. We can identify the moral tale (Ribbens McCarthy, et al., 2000) that is being told here: that despite not being involved in the PTA, this respondent is a 'good parent'. Interviewer: Did you get involved with the school - Parent Teacher Associations, things like that? C.100: Not particularly Parent Teacher Association, because having quite a lot on ourselves, because I do my husband's paperwork as well as doing the job myself, running the house, looking after the children, because he's so busy. But I did involve myself in a lot of things. I always showed interest in everything that they did. [I] went into school and made it our business to know if there was anything we could do to help, obviously involving themselves in their work and showing as much interest as we can. As we have seen, social involvement in the PTA varied in our two areas. For the Wilmslow respondents, participation in this organisation was presented as 'normal' behaviour. However, in Cheadle it was non-participation that was more likely to be narrated as the norm. In general, Cheadle residents were more concerned with 'getting by', and were more likely to draw on their strong ties of residency and kin to achieve this, rather than building loose networks based around participation in the PTA. In both areas we have shown how narratives around children are used as a mechanism through which belonging is performed, but we have also shown how social diversities frame narratives of involvement. We have shown how, for many of our Wilmslow respondents, participation in the PTA was narrated as the norm. At the heart of many of these narratives, particularly but not exclusively in Wilmslow, what is being articulated are tales about being a 'good' parent and more particularly tales of being a 'good ' mother. It is vital that we recognise that performing social involvement through children is a gendered practice. However, we have also shown how the distinctive habitus in each locale influences patterns of participation and the ways in which they are talked about. One key way in which the mobile, middle class in Wilmslow seeks to build social capital is through the generation of loose social networks, based around children and children's education. This serves the dual purpose of connecting these residents to 'like-minded' people and to the educational establishments they value as a means of getting ahead. In Cheadle, the generally less mobile respondents have a much more local habitus. They are much more embedded in the locality, and in patterns of sociation they lean towards the bonding forms of social capital with tighter social networks based around, kin, residence and leisure that enable them to 'get by'. It can be argued that these narratives exemplify the relational aspects of physical place and social identity, and that the instrumentality of the narratives can be related to the differential degree of embeddedness that the respondents display in each area. In Cheadle, Bourdieu's comment that 'the lack of capital intensifies the feeling of finitude: it chains one to a place' (Bourdieu, 1999: 127), seems particularly resonant. 1'Lifestyles and social integration: a study of middle class culture in Manchester', Ref number R 000 23 6929. 2We say nothing here about Chorlton and Ramsbottom, two other areas of our research. The full account of our research is to be published as Savage et al. (2004). 3 Data used in this paper is derived from the achieved and successfully transcribed, 45 interviews in Wilmslow, and 43 in Cheadle. 4 In the case of people not currently employed, their previous job was a service class occupation. 5 The categories reflect the following income, A: under �10,000, B: �10,000-19,999, C: �20-29,999, D: �30,000-39,999, E: �40,000-49,999, F: �50,000-59,999,G: �60,000-69,999, H: �70,000-79,999, I: �80,000-89,999, J: �90,000-99,999, K: �100,00+. 6 The PTA is generally but not exclusively associated with primary level education, and Parents Associations are more prevalent in secondary level education. 7 Neighbourhood Watch schemes (14%) and Tenants/Residents Association (5%) were first and second (Social Trends, 2001). 8 Respondents with children who had now left home or were at University also demonstrated similar levels of membership and involvement with PTAs. 9 Involvement here has been categorised at three levels, superficial, if the respondents support and attend events organised by the PTA, medium if the respondents also help organise events and other activities, and deep if respondents do all of this and attend committee meetings or have official committee roles within the PTA. 10 The norm here was for children to be educated in the state sector at primary level, and for the independent sector to be used at secondary level. BOURDIEU,P. (1977) 'Cultural Reproduction and Social Reproduction' in J. Karabel and A.H. Halsey (editors) Power and Ideology in Education. New York: Oxford University Press. BOURDIEU, P. (1993) The Field of Cultural Production. Cambridge: Polity. BOURDIEU, P. (1998) Practical Reason. Cambridge: Polity Press. BOURDIEU, P. (1999) The Weight of the Social World. Cambridge: Polity. BRANNEN, J. and O'BRIEN, M. (1996) Children in Families. London: Falmer Press. DEPARTMENT FOR EDUCATION & EMPLOYMENT (1997) Excellence in Schools. London: HMSO. ETZIONI, A. (1996) 'The Responsive Community: A Communitarian Perspective', American Sociological Review,Vol. 61, pp.1-11. FRAZER, E. (1999) 'Unpicking Political Communitarianism: a Critique of "the Communitarian Family"' in G. Jagger and C. Wright (editors) Changing Family Values. London: Routledge. GIDDENS, A. (1998) The Third Way: The Renewal of Social Democracy. Cambridge: Polity. GOFFMAN, E. (1969) The Presentation of Self in Everyday Life.London: Penguin. GRANOVETTER,M. (1973) 'The Strength of Weak Ties', American Journal of Sociology,Vol. 78, pp. 1360-1380. HALL, P.A. (1999) 'Social Capital in Britain', British Journal of Political Science, Vol. 29, pp. 417-61. JAMES, A. and JAMES, A. (2001) 'Tightening the Net: Children, Community, and Control', British Journal of Sociology, Vol. 52, No. 2, pp. 211-228. JOHNSTON, M and JOWELL, R. (2001) 'How Robust is British Civil Society?' in A. Park, J. Curtice, K. Thomson, L. Jarvis and C. Bromley, British Social Attitudes Survey. London: Sage. LONGHURST, B., BAGNALL, G., and SAVAGE, M. (2001a) 'Ordinary Consumption and Personal Identity: Radio and the Middle Classes in the North-West of England' in J. Gronow and A. Warde (editors) Ordinary Consumption. London: Routledge. LONGHURST, B., BAGNALL, G., and SAVAGE, M. (2001b) 'Narratives of Participation and Non-Participation: Middle Class Involvement in Voluntary Associations in the North West of England.' Paper to ESRC Seminar Series on Social Networks. NATIONAL CONFEDERATION OF PARENT TEACHER ASSOCIATIONS (2002) At PARK, A., CURTICE, J., THOMSON, K., JARVIS, L., and BROMLEY, C. (2001) British Social Attitudes Survey. London: Sage. PUTNAM, R. (2000) Bowling Alone. New York: Touchstone. REAY,D. (1998) Class Work: Mother's involvement in Children's Schooling. London: University College Press. REAY, D. (2000) 'A Useful Extension of Bourdieu's Conceptual Framework? Emotional Capital as a Way of Understanding Mother's Involvement in their Children's Education', Sociological Review, Vol. 48, No. 4, pp.568-585. REGIONAL TRENDS 36 (2001), London: HMSO. RIBBENS McCARTHY, J., EDWARDS, R. and GILLIES, V. (2000) 'Moral Tales of the Child and the Adult: Narratives of Contemporary Family Lives under Changing Circumstances, Sociology, Vol. 34, No. 4, pp.785-803. RIBBENS McCARTHY, J. and EDWARDS, R. (2001) 'Illuminating Meanings of "the private" in Sociological Thought: A Response to Joe Bailey', Sociology, Vol. 35, No. 3, pp. 765-777. SAVAGE, M., BAGNALL, G. and LONGHURST, B. (2001) 'Ordinary, Ambivalent and Defensive: Class Identities in the North-West of England', Sociology, Vol. 35, No. 4, pp. 875-892. SAVAGE, M., BAGNALL, G. and LONGHURST, B. (2003a, forthcoming) 'The Conveniences of Place: 'Northerness', Belonging and Identity in the North-West of England', in T Bennett T and E Silva (editors) Cultures and Everyday Life. Brighton: Sociologypress. SAVAGE, M., BAGNALL, G. and LONGHURST, B. (2003b, forthcoming) 'Habitus, Locality and Class in the Remaking of Urban Space' in F. Devine, M. Savage, R. Crompton and J.Scott, (editors), Class, Culture and Identity. Basingtoke: Palgrave. SAVAGE, M, BAGNALL, G., and LONGHURST, B.J., (2004, forthcoming) Globalisation and Identity. London: Sage. SOCIAL TRENDS 31 (2001), London: HMSO. SOUZA BRIGGS, de X. (1998) 'Doing Democracy Up Close: Culture, Power, and Communication in Community Building', Journal of Planning Education and Research, Vol. 18, pp.1-13. SULLIVAN, A. (2001) 'Cultural Capital and Educational Attainment', Sociology, Vol. 35, No. 4, pp.893-912. WARDE, A., TAMPUBOLON, G., TOMLINSON, M., RAY, K., LONGHURST, B.and SAVAGE, M., (2003), 'Trends in Social Capital: membership of Associations in Great Britain, 1991-1998', Research Note in'British Journal of Political Science', June. WYNESS,M. (2000) Contesting Childhood.London: Falmer Press.